I father-in-law has an Atrix 2 and the screen was in perfect condition. It was running extremely slow, so i did a factory reset for him. There is now a weird mark on his screen that seems to get bigger everyday. I told him it has nothing to do with the factory reset, but I believe he may have had it in his one cargo pocket and press against something. 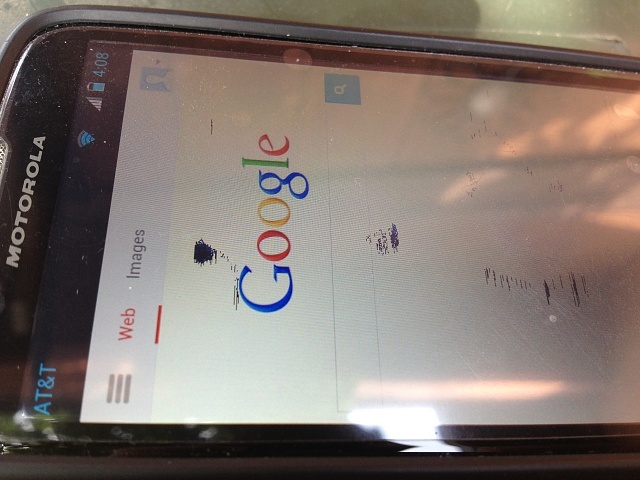 There is no visible damage to the exterior of the screen. I have attached a photo to see if anyone has had this happen and/or know what it could possibly be if it is not from physical damage. I've seen that on one of my old laptop LCD screens. They're a bunch of dead pixels, and it will probably spread. Not sure if there's anything you can do to reverse it--sorry! Additional trauma can hasten the deterioration, so tell your father-in-law to protect that screen from bumps and thumps. I could be wrong--after all, the screen technology might be a little different from the old LCD on my laptop. 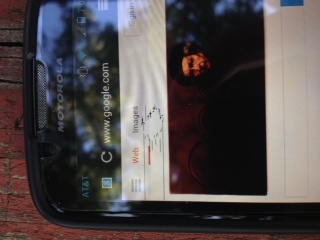 You could try running a dead pixel test app--just go to Google Play and search for "dead pixel." so i ran a deal pixel app, and no luck. As of today, it appears the blemishes seem to be moving around. Look at attached image. Did anyone every experience this? Kind of weird. A failing LCD can cause dead pixels to spread, but I've never seen them move around. Please help!!! This image shows on my device, take a look.